A small, dark seabird with a white rump and fluttering flight, this species (lies low over the water, often pattering with its feet on the surface. It feeds on small animals picked from the plankton and follows fishing boats for offal. 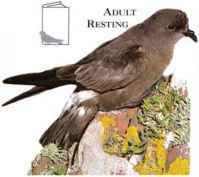 Breeding colonies are on offshore islands; the birds visit their nest burrows at night, uttering harsh, churring calls. • Distribution Breeds on islands in N.e. Atlantic and in W. Mediterranean. distribution flying Adult Winters far out at sea.